The Queensland Derby represents the last big staying even for three year olds of the season, and the last chance for these horses and trainers to come good and bring home the results after a season of training and preparation. This year’s race promises to be a very close run thing, with three horses all under the 5.00 mark, and chased by a very competitive field. A lot of attention has been placed on the three horses leading the first three lines of betting, and it will be a long slog to the line for both punters and trainers alike. The best place to have a bet on the 2014 Queensland Derby is with Bet365.com. The odds below were taken from the site, and you will be able to find the latest race odds there as well. Bet365.com is also offering each-way betting on the race, with which you will receive 1/4 if should your selection place in positions one to three. There are virtually three joint favourites for this race, with Pinstripe Lane the smallest of margins shorter than Vilanova and Elusive Runner, but there is little to choose from among these three strong runners. Tony Corstens’ Pinstripe Lane will come into the race with some good form behind him, following up an impressive win at Rosehill in May with another strong performance when placing second in the Group 2 Grand Prix Stakes over 2,200 metres. He has run over the 2,400-metre distance of the Queensland Derby, and will be a strong contender on Saturday. The Chris Waller-trained Vilanova will be one of the main impediments to the line for Pinstripe Lane. He came up with his best ever performance in that Grand Prix Stakes winning ahead of Corstens’ runner, and, so close to this race, it will be difficult to take that performance and result out of the equation when looking at the Derby on Saturday. He is seen as a bit of wild card, however, and it will be difficult to back him without some degree of apprehension regarding his consistency. But if the right Vilanova turns up on the day he will be difficult to beat. Of the top three runners Elusive Runner is maybe the less fancied. 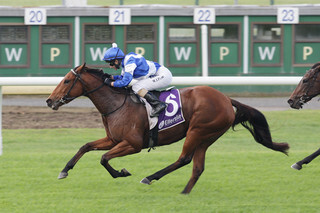 The gelding, who won his first race in the Hibernian Hotel Plate at the end of April, has been stepping up in class and distance since making a delayed debut, but has been steadily impressing. He was second behind Pinstripe Lane at Rosehill Gardens in his city debut, and finished very strongly in the 2,000-metre Sportyear Handicap for another second place. it will be a big step up to Group 1 status however, you feel. As mentioned above, the best racebook to place a bet on the 2014 Queensland Derby is Bet365.com, who will offer the best odds on the race. When visiting Bet365.com, click on ‘Horse Racing’ in the left sidebar and scroll down to the Antepost section of the page, where you will find the markets for this race and many more. The Queensland Derby is a Group 1 race for three-year-old horses and is run over a distance of 2,400 metres at the Eagle Farm Racecourse in Brisbane, Australia. The race has purse of $500,000 and the 2013 edition of the race was won by Hawkspur.